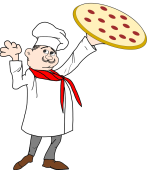 Luigi’s Pizza & Fun Center has been serving up delicious food and great times to the residents of Aurora since 1953. We provide our guests with everything from fresh-made pizza, and sandwiches to a bowling alley, an arcade with 130+ games, and even a laser tag arena. We have something for everyone, whether you are a kid or a kid at heart. From bridal showers to service organization meetings and birthday parties, we have an extensive menu that caters for every occasion. Stop in today or contact us for more information!